We are building relationships with our community so the voice of our patient and service users is at the heart of all that we do. North Cumbria University Hospitals Trust runs our two main hospitals the Cumberland Infirmary in Carlisle and the West Cumberland Hospital in Whitehaven. Cumbria Partnership NHS Foundation Trust runs our community and mental health services, including district nursing. 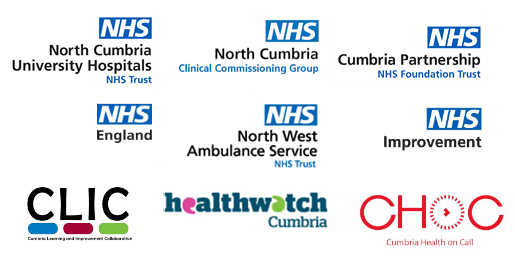 NHS North Cumbria Clinical Commissioning Group plans and buys most of our clinical services and reviews performance and quality. It also supports our GP services. Our system also involves GPs, Cumbria Health on Call (CHoC), North West Ambulance Service, NHS England, NHS Improvement, and our many independent providers of home care, care homes and nursing homes. Our health and care system values our vibrant third sector organisations – many of them are providers as well as advocates for key groups in our community including carers, those with disabilities and older people. Cumbria CVS provides a valuable connection to our third sector partners. Healthwatch works with our communities and checks we are delivering effective services. Our Cumbria Learning and Improvement Collaborative (CLIC) is developing continuous improvement in our services and teams. Working in partnership with Cumbria County Council. Joining up our health and care services is an important step to making sure everyone in our community has access to the right care when they need it. We want that care to be seamless. Whether you need to be admitted to hospital or when you are well enough to go home you should get the right support. Bringing our teams together means they can work more effectively across pathways and conditions to deliver care in a fully integrated way.